In Editor, when a user adds a new screen, they will have the opportunity to pick from the templates in their libraries. 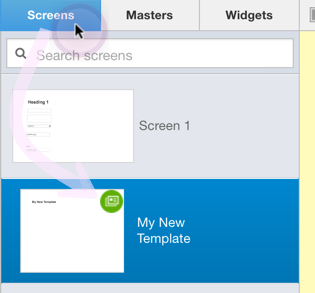 The content from the selected template will give them a jumpstart on the creation of their new screen. A good library should have one template for each screen layout and/or target device type (e.g. iPhone, iPad, Screen 1024x760, Screen 1680x1050). Additionally, it's always a good idea to include a few blank templates in your library (for various screen sizes and device types) for those users who want to start with a blank slate. Click on the + (Add) button and select 'Template' in the 'Add New' window. A new template screen will be created in the Screens called 'Template 1'. It's a good idea to rename the template. Templates are distinguished from normal screens by a green circular icon in the top right of the template screen. Add widgets and actions to your template. To use a library template in your project, click on the + (Add) button and select 'Screen' (or 'Template' if you wish to create a copy of the template in your current project) in the 'Add New' window, and select the project that contains the template that you created in your Library project. If you want to be able to select your project templates when creating a new project, then copy the project to the Project Templates folder. See article Creating Project Templates for details.